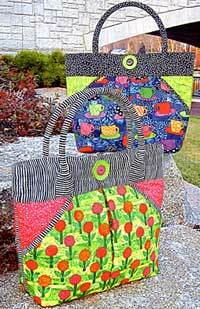 The West End Tote pattern by Aunties Two is a practical tote to help keep you organized every day! There are 4 pockets outside, 4 pockets inside, and instructions are included for either a decorative pleated front or a gathered front. There are double handles and the finished size is 12"W x 12"H x 5"D.
Stiff interfacing (Craft-Tex, Peltex) - 2 strips 1 3/4" x 20 1/2"